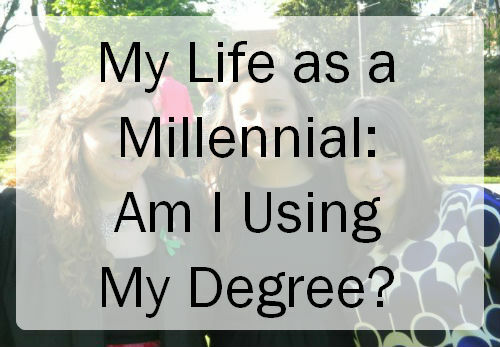 MY LIFE AS A MILLENNIAL: AM I USING MY DEGREE? I graduated from a private, four-year university with my bachelors degree in 2012. My degree is in music with a minor in arts administration. I was extremely fortunate to land a job in my field in June of 2012. I still work for that same company, and I have been since promoted from my starting position. Sometimes I am at work and I find myself thinking to myself: "Am I using my degree?" I am tens of thousands of dollars in debt for that piece of paper that qualifies me to do this job, and sometimes I don't feel like I use it at all. This is something that Dave and I talk about often. We both went to Liberal Arts Colleges, and we both agree that college is about more than your field of study. I think that becoming a well-rounded individual and the things that I learned about philosophy and math are just as important as my music and business skills. With the economy being how it is, and jobs being scarce, for many jobs it is mandatory that you have some sort of degree or training. But that doesn't mean that you will always necessarily use those exact skills. Many companies do on the job training and professional development so that employees have the exact skillset needed. So as for whether I am using my degree or not... probably about 60% of the time, and I think a lot of that is due to the stage in my career that I'm in. In the Humanities you don't step out of college as a leader, and I just have to keep working my way up and flexing those brain muscles to use that degree! However I wouldn't be here in my job without it. So I am extremely thankful for that. What about you? Do you use your degree in your career? Do you think it makes a difference in the job market these days? I graduated with a Recreation Management degree, emphasis in therapeutic recreation from BYU. So basically i have a degree in running fun programs! I've worked at a library for 4 years and I've run a couple programs, but nothing comparable to what my degree is really for... now I'm thinking about getting a master's in something useful, maybe even a tech degree in a healthcare field! This economy is really tough on our generation!! It is tough! I have been talking with some of my friends about this during the past couple of days, and we all agree that though we may not use our degrees all the time, we wouldn't have our jobs without them. It's such a vicious cycle. I graduated in 2012 and only now am in a job where I'm using my degree. I'd still say college was worth it for me--no regrets about what I studied or where I went to school, and I'm glad I'm now in a place where I can use what I learned. On the other hand, my husband was a nursing major in college, and as a nurse he obviously used what he learned--but now, after 5 years as a nurse, he's in a different career for a while. Like you I was VERY fortunate to find a job where I could use my degree - and I do think I use it on a daily basis. However, I think this country would be a lot better off we didn't push everyone to get a college degree. There are SO many great jobs that require only skills training. I know in my city we're really lacking in manufacturing positions - ones that need only 90 days of training, start out at $40,000 a year and have room for advancement and opportunities to have your degree paid for later. To me that sounds much better than spending my first 5+ years after graduation paying off the mountains of debt I got from my private liberal arts education. You know? I totally agree with you. I wish there was more of a push for this in our high school system. I think there has become a little bit of a stigma attached to those who choose not to go to college, which is totally unfair. 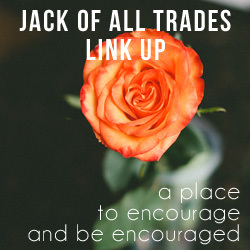 Tradesmen and women are HUGE contributors to the economy, and I think many young people would benefit from knowing more about these types of jobs. As a teacher I need to have a degree to do my job but am I using any skills that I was supposed to have gotten in university? No. It's unfortunately but true.